Announcing the Biggest Sale of the Year - Black Friday 2018! ? 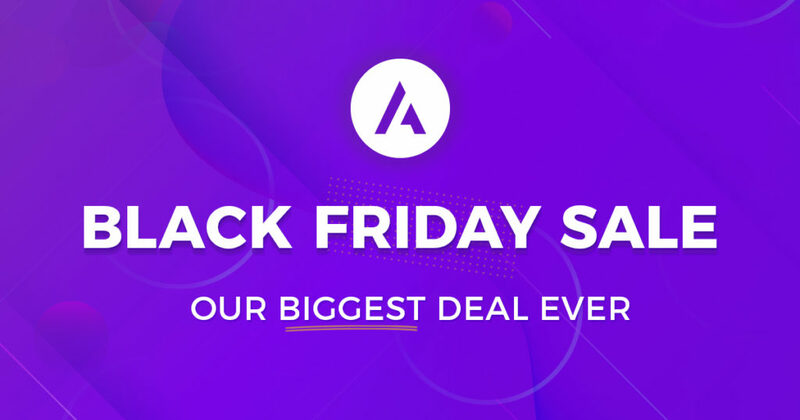 Announcing the Biggest Sale of the Year – Black Friday 2018! ? Black Friday comes only once a year and brings the BIGGEST DISCOUNTS for you! Like every year, this year too we are hosting huge discounts across our store and a crazy giveaway that can give a chance to win an all-new MacBook Air for free! Before we move on to the offer, let me quickly take this opportunity to thank each one of you for contributing to making Astra the most popular WordPress theme to have crossed 100,000+ downloads within a year! We are very grateful to have a community that stands by us and provides us with some great feedback that helps us to improvise and enhance the user experience. We would also like to thank you for sharing your love and for writing a review for Astra. 900+ 5 star ratings speak it all! If you’ve been on the fence about whether you want to purchase Astra Pro or upgrade to the Mini or Agency Bundle, the time to act is unmistakably right now. Yes, the only time of each year that we offer our biggest discount ever. Save up to 30% OFF on new purchases and upgrades! Don’t Know Astra Pro Yet? The Astra Pro addon is an enhancement to the Astra theme that adds several modules to add stylish headers and footers, manage colors and backgrounds, change blog layouts, and do a lot more through the easy-to-use WordPress Customizer. The combination of Astra with Astra Pro lets you create a beautiful website without writing a single line of code. Get Astra Pro with 25% Discount now! If you are already using Astra and Astra Pro, upgrade to the Mini Agency Bundle or the Agency Bundle with 30% discount! Ultimate Addons for Beaver Builder or Elementor: You can opt for any one set of Ultimate Addons depending on the page builder you are using. Upgrade to the Mini Agency Bundle with 30% Discount now! Astra Premium Sites: 50+ professionally designed ready-to-use website demos (created with Elementor and Beaver Builder) that can be imported, tweaked and used directly. Upgrade to the Agency Bundle with 30% Discount now! Beyond the discounts, we have a giveaway in which you can participate! Grab more points and win a chance to get an all-new MacBook Air for free! When will the deal be ending?